Yandex.Site Search is easy to install and set up. Yandex Site Search is the perfect solution for adding a search function to your website. Why do I need a search box? To help users navigate your site by placing everything at their fingertips! Yandex Site Search uses all the same technology as Yandex main search. It understands various word forms, corrects mistakes and typos, as well as incorrect keyboard layouts. 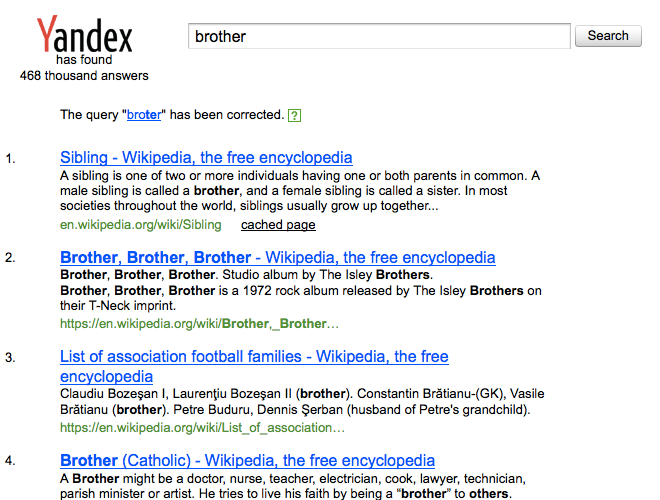 Yandex Site Search not only finds the words included in the search query but also any synonyms. 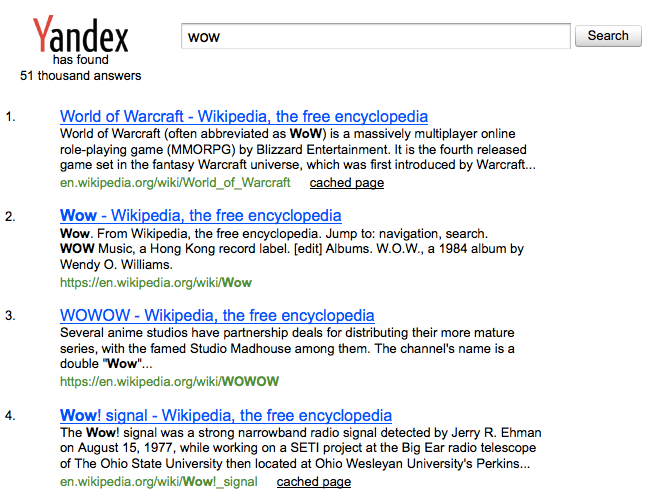 For example, if a user is searching for information on World of Warcraft, they may not use the game's full name. The search could be anything from [Warcraft], [WoW] to [ВоВ], but Yandex still understands what this person is after and finds the relevant information. 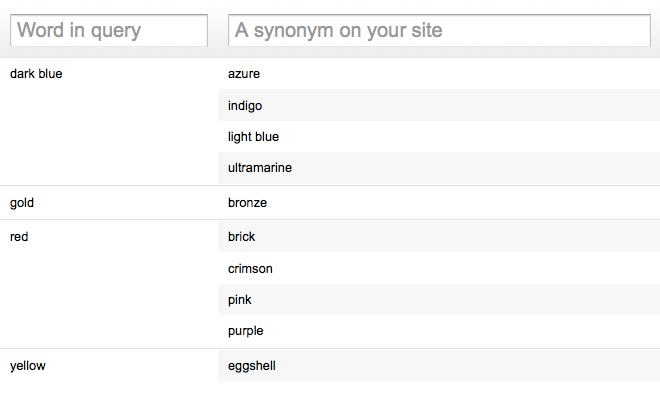 You can add your own variants of synonyms to the search base specific to your site and users. Yandex.Search for sites offers a simple and intuitive interface for this. In the left column, add the words that your users enter in the search field and in the right column input the corresponding synonyms from your sites or site pages. You can choose for yourself how Yandex search looks on your site. It can be a bright interface feature or to a more modest, but noticeable role as an aide in the navigation. Everything depends on your preferences and goals. It's up to you to decide whether to leave the standard appearance that all Yandex users know or to design the search bar and results in your company's colors. If it turns out that the standard appearance options for the search bar and results aren't enough to fit the search feature perfectly into your site's design, you (or your developers) can apply your own CSS styles to the necessary search bar or results' elements. Thanks to this feature you can fully manage search's appearance and supplement it with all the features you need. If there are video clips or images in the found documents, a preview of them will be placed in the search results. You can also change the previews' appearance by applying your own CSS styles. 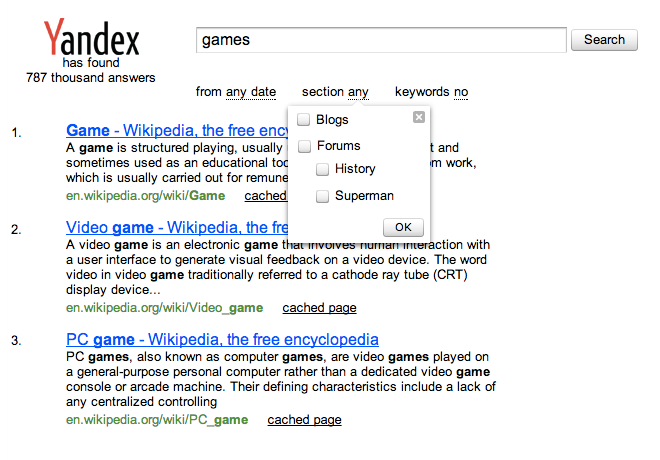 You can customize the design of the search box or keep the classic Yandex arrow. 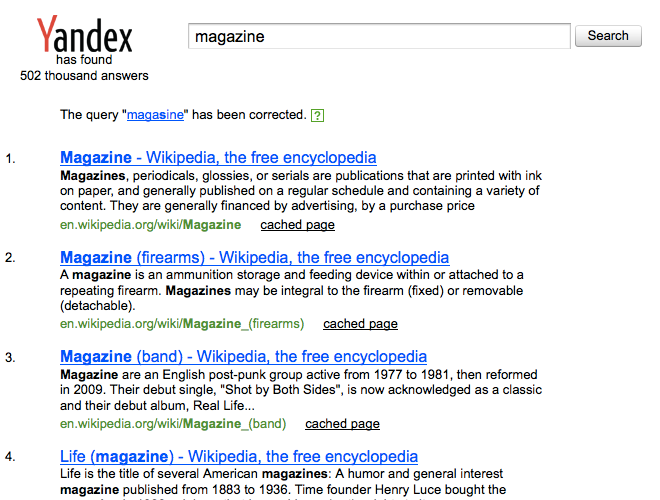 Search results can either open in your site or on Yandex like this. Yandex Site Search provides search suggestions just like the main search page. 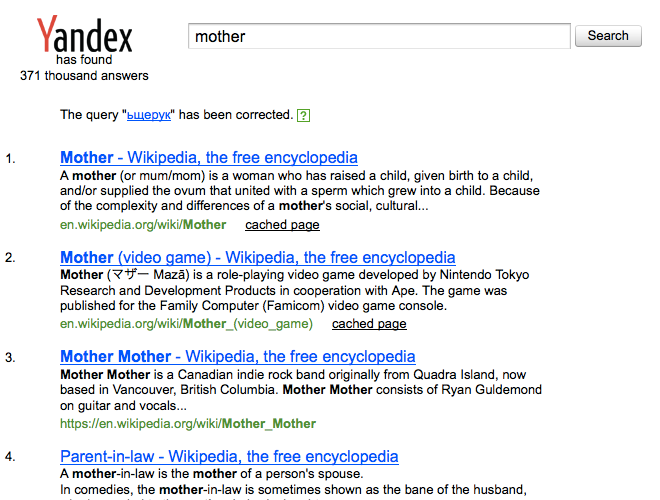 This feature helps users search more quickly and saves them entering the search in full. Yandex will create a custom set of search suggestions for you. They will take your users' searches and site content into account. Site Search even knows how to correct typos, grammatical errors and the incorrect keyboard input language, even if they all occur at the same time. Autocorrection works for Russian, English, Ukrainian, Belarusion, Turkish and a number of other languages. 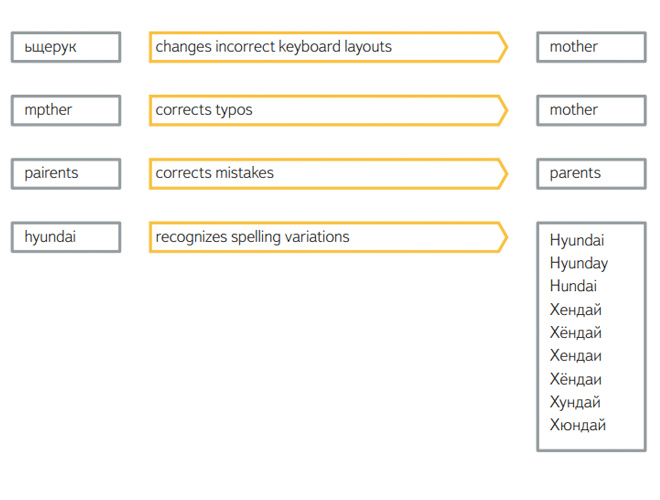 Search suggestions can correct errors or typos and automatically correct the keyboard input language. You can edit the suggestions proposed by Yandex as you see fit. You can also add new suggestions, change the order of existing ones or delete any you don't need. Use this tool to nudge users in the right direction when searching your site. Help visitors of your site find exactly what they're looking for, whether it's an article published in August 2010 or a document from the "Articles and Tests" section. Yandex search boxes provide a wide range of search constraints, which let users select the site section, time range, document format or language. 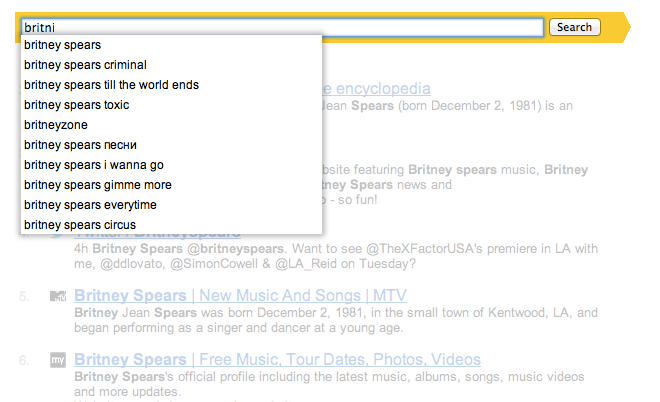 You can also specify keywords that users can add to their searches. For example, if you run a computer games site you could add "game", "review", "purchase" etc. This is how search constraints will look in your search results. 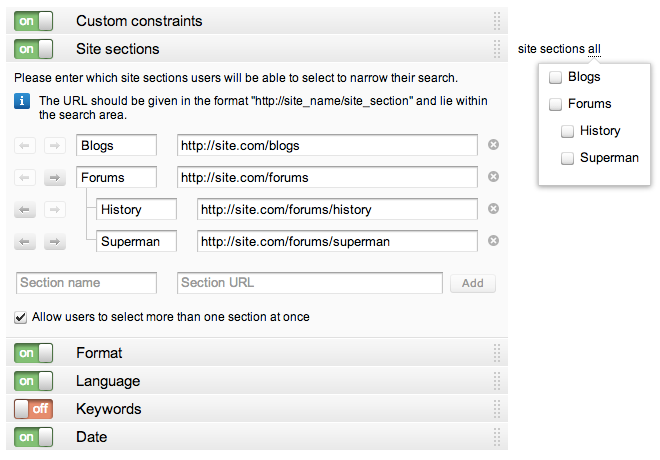 Create a custom search topic if you just want to search a specific group of sites. One topic can cover up to 100,000 sites and you can easily edit the sites you want to include using HTTP requests. Simply draw up a list of sites, create a topic and send it for moderation. Once approved, you can use your custom search on Yandex Site Search or Yandex.XML. 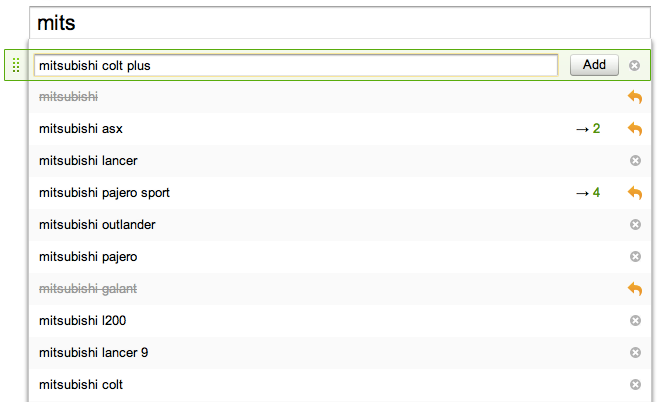 Visit the "Statistics" section if you want to find out what your users search for. 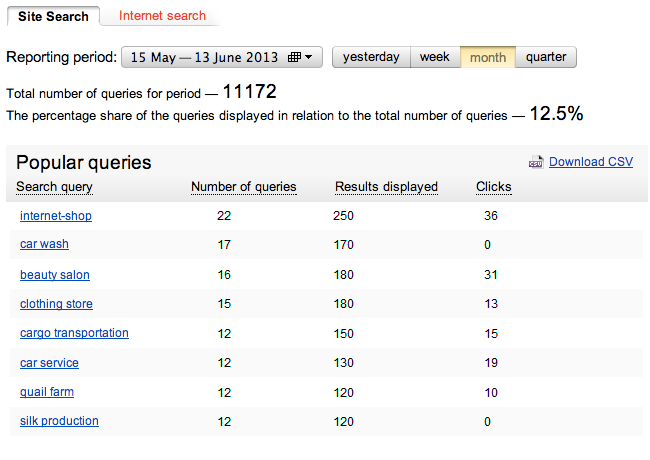 the number of search results referrals. This information can help you work out which site sections need improving.